Even the bouncers looked familiar. (I know. That doesn’t paint me in a terribly good light.) 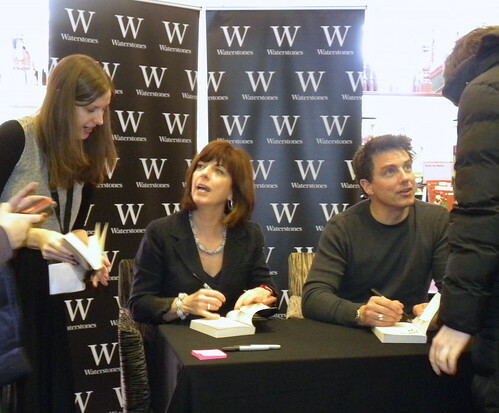 And, you know, bouncers at a book signing? Also, my reputation must have preceded me, as they gave me my own private enclosure, complete with armchair to sit in and everything. I could get used to this. They had a school event in the morning. They had another in the afternoon. 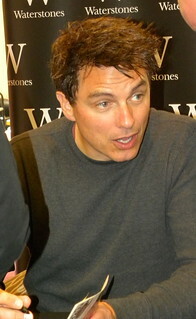 What they had in between was an hour of signing books in Edinburgh’s Waterstones West End. 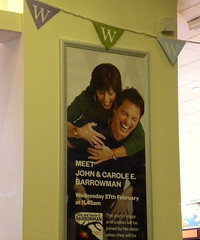 Luckily – because it wasn’t half term – they ended up with approximately one hour’s worth of a queue as well. I’d been thinking they might never make it to their second school. Many went home very happy. Especially the ones at the end who persuaded John to pose for photos with them. 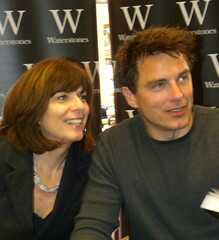 A true friend is one who says she will have her picture with John taken after you have had yours. Good signing session. Very well organised. Lovely Mandy (still hope it’s the right name) gave me a ‘wee coffee voucher’ for afterwards, which I put to good use on a not very wee tea. I even had a wee cupcake, and I sat down at a table in the corner (which wouldn’t normally have been my first choice) to enjoy it, my enclosure business all done and dusted. It was the witchiness. That corner turned out to be the route Carole and John took as they left. They said hello. I spoke to their hardworking publicity star Ana. Maybe they had time to gulp down a wee lunch. (Pardon me. I’ve got stuck on wee. It’s so lovely and Scottish.) Maybe they didn’t. Check here for more signings. And apologies for going on about hair. It is not really of very authorly importance. 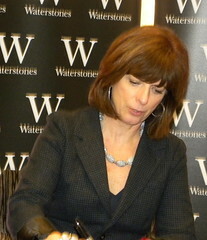 But this was the celebrity signing. The one with bouncers. Satan has added an extension. There is now a tenth circle down below. It’s all very hush-hush, though. And it really is true that there is less difference between the people upstairs and the people downstairs. I wouldn’t buy a used car from any of them. My tip to you for reading this book is that every little detail counts. If it is there, it will have some significance later. Zac is a thief. 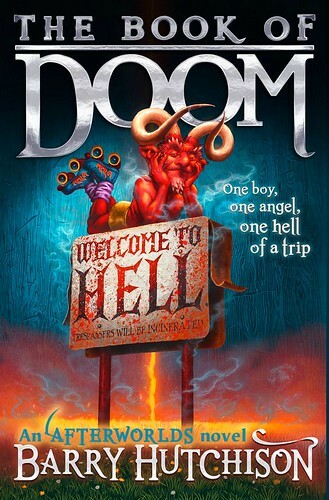 He gets called upon by Gabriel to find The Book of Doom, which Satan has stolen. He gets paired off with the half-angel Angelo, who comes with him to help find the way to Hell. Angelo is not as good at this as you’d think. But getting lost can have its advantages, and meeting a Valkyrie is not a bad thing. There are a lot of Hells, really. They visit a few of them, until they get to the tenth circle. Which is not a nice place. Nor are the people there nice. But you’d expect that. There are other things you might not expect. The lesson here is that you can find goodness anywhere. Heaven isn’t necessarily the best place for it. Even God had enough and left. Being a thief doesn’t have to mean you’re bad. And friendship grows when you least expect it. It’s travel time again. A quick dash north, and an equally quick one back. Or I hope it will be. I suppose I have jinxed the trains by saying/thinking this. My bag isn’t full of things this time, so much as simply being a bag. OK, there are a couple of new reads for Daughter; Eleanor Updale and Marie-Louise Jensen. But I am primarily bringing the bag that ‘someone’ was unable to take last time. I’m the bag lady. But you know, back in my childhood, who’d have thought you’d be able to sit looking at a small machine on your desk or kitchen table, checking if your train is running to time? (Or running at all.) On the other hand, back then who’d have thought there would be a need to? Trains ran. Often on time. I was excited to see that Sophie Hannah is doing an event in Dundee this evening. I’ll be close, but not close enough. 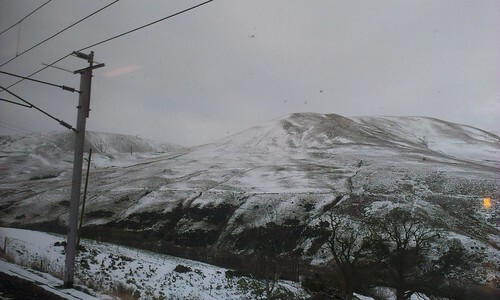 After her event I’ll be freezing on the platform at Dundee, while she is no doubt warm in a hotel somewhere. Too far away for Barry Hutchison’s launch of The Book of Doom in Aberdeen. Also tonight. It feels funny to be closer than usual, but still too far away. Maybe I should move to Scotland? There are things going on here. 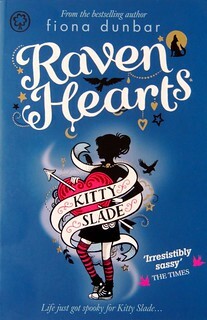 Kitty Slade has moved on since Divine Freaks, almost two years ago (that’s in Bookwitch time), and here she is, in deepest Yorkshire, where they don’t speak in the same way. Some things never change, though, like the ghosts which Kitty sees every day. 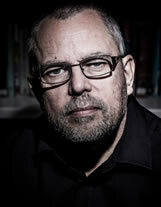 Think Yorkshire Moors and ghosts, and you have a most interesting set-up. Kitty and Sam and Flossie and their unusual, and very Greek, granny are travelling the country, as they stop off for some Yorkshire ghosts on their way to Scotland. But the funny thing is that for all the reported and unexpected deaths in the area, Kitty sees surprisingly few ghosts. Are people simply not as dead as they could be? She has to investigate, and some things go well, and others not so. Kitty also acquires a new ‘best friend’ and she shows off her ‘London ways’ to the astonished natives. There is a sinister looking black bird following Kitty around. What does it want, and is she in danger? And what about the dogs in the night? As always with Fiona Dunbar, this is an intelligently written, humorous book. It’s the kind of story I imagine any young reader of a certain age would love, and we don’t see enough of them. And I’d like to think we could find out what adventures the intrepid quartet will encounter in Scotland, but I understand the six books featuring Kitty Slade have shrunk to four, and Raven Hearts is the fourth, so that’s it. We’ll simply have to conjure up our own Scottish ghosts. We just won’t do it so well. Whether it’s lack of time, or just that I’m a wimp, remains to be seen. But while my nerves are debating Alan Gibbons’ new novel, Raining Fire, I’d like to introduce you to Alan introducing his book. There are four equally watchable YouTube clips for anyone wanting to know what the book is about. I have to admit that my pulse went up while watching, and I feel wimpier than ever. What surprises me the most, is that Alan writes books at all. I don’t think I know any author who travels so much or who puts quite such a lot of his time into things for ‘the greater good,’ like the Campaign for the Book to save our libraries, or just plain book event travelling. Hull, or Hong Kong (I’m partly making this up), it’s all the same. It’s marvellous that he does, though, and I believe Alan’s books fulfill an important role for boy readers. Crammed with boy stuff, and written by someone with the right ideas about things. For my 100th bite I am donning my gossip magazine disguise, and we are going royal. Admittedly, the combination of authors and royals in the news has been somewhat unfortunate this week. But all is rosy chez BWB! Earlier this week Nicola Morgan casually dropped the bombshell that she was agonising over what to wear for a dinner at The Palace. She’s in Edinburgh, so that would be Holyrood. I’m not sinking low enough to deal with the garment situation, because I’m all excited knowing someone who dined with the Princess Royal! So now you know. The rest of us can only dream. Further good news is that Celia Rees has won the Coventry Book Awards 14+ category for This Is Not Forgiveness. Well done! More good news for Michael Grant fans. The last Gone book – Light – will be here in just over a month. So will Michael himself, and Dublin fans will be delighted to hear he is actually coming to Ireland this time. Hang on for more details. Finally, a big WELL DONE to all of you who bought/downloaded The Storm Bottle last week. 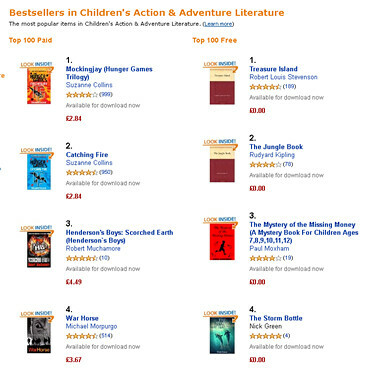 Nick has reported back that it was a resounding success, with sales both sides of the Atlantic taking his book to seventh and sixth place respectively, and a lovely fourth place in the free children’s action and adventure category. So you see, pulling together does help! Sorry, but this isn’t going to be about yetis. The first one was in Far Rockaway. In order to avoid spoilers, I’ve not said as much about Victor Manno as he deserves. He reads books and is fun company for his grandchildren. He is brave. He attacks a fire truck with his stick, to save his granddaughter. He appears in her delirious thoughts/dreams as she fights for survival. He’s a real hero. Unfortunately, I can’t tell you much more. This ‘book’ Like Clockwork, by Damien M Love, is being published in six parts for Kindle. So far I’ve read the first part, which also exists in some kind of old style newspaper format. And you know me; I am cynical enough to expect the worst of gimmicky things. But, this is pretty good. In fact, I’d say, very exciting. A person could easily be forgiven for feeling that it would be nice if these parts could appear quicker. Like now. What’s worse is that the first part is only published in mid March, and the rest will appear weekly after that. They had better! I want to know what this weirdo grandfather is going to do with the robots, and those men he… And whether he and Alex..? Like Clockwork is rather like Clockwork. Philip Pullman’s Clockwork. Not so much the plot, as the feeling of general creepiness. It’s continental, and it’s got machines that seem to think. Nicely menacing. I think it might be possible to find out more here. And, you know, I am sure time will go faster soon. Tried to google me an illustration to go with this. Like Clockwork didn’t appear. At all. Spooky.